Big events always bring fresh and creative ideas and offerings. If it was Youtube celebrity game during Oscars awards season, here is first Cricket game on Youtube during IPL (Indian Premier League) season. You get to bat for 2 overs in this Youtube videos based cricket game and score maximum runs (of course). When a ball is delivered, it pauses for a while and gives you an option to click on buttons labeled: A,B,C,D. You click a button and guess your hit, this add hits manually to your total score and remembers it. At the end of each hit, a button is displayed to go to next ball in the game. 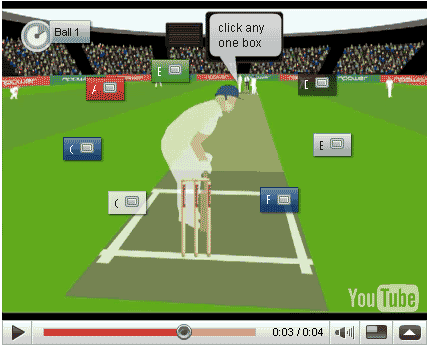 Finally, at the end of 2 overs you can share your scores by writing in the video itself. Cricketitis cricket Youtube game [more details] has cool interface but video streaming mismatch can take little shine off this game. Overall its a nice attempt to use Youtube medium to create a game on cricket, this for sure will get lot of hits from curious cricket fans.